Summer is coming and that means one thing – tye-dye season. 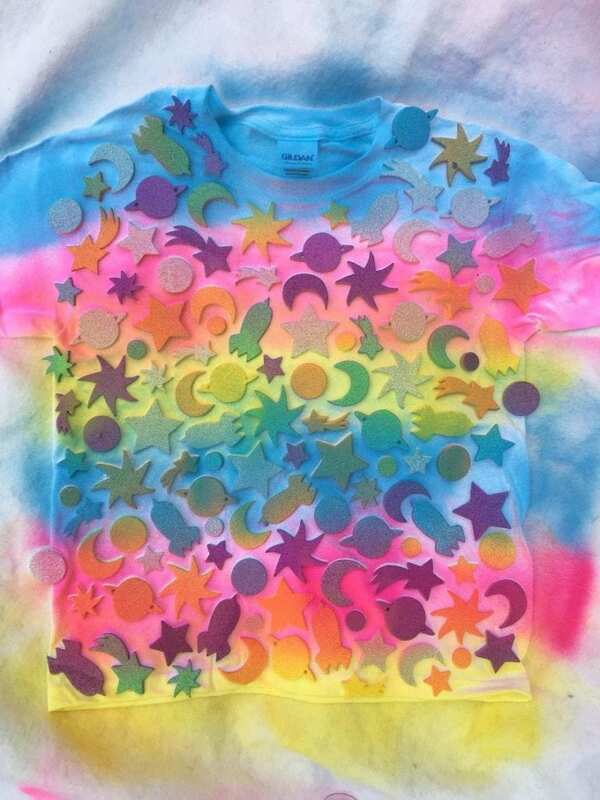 Something about the summer screams colorful DIY dyed clothing. 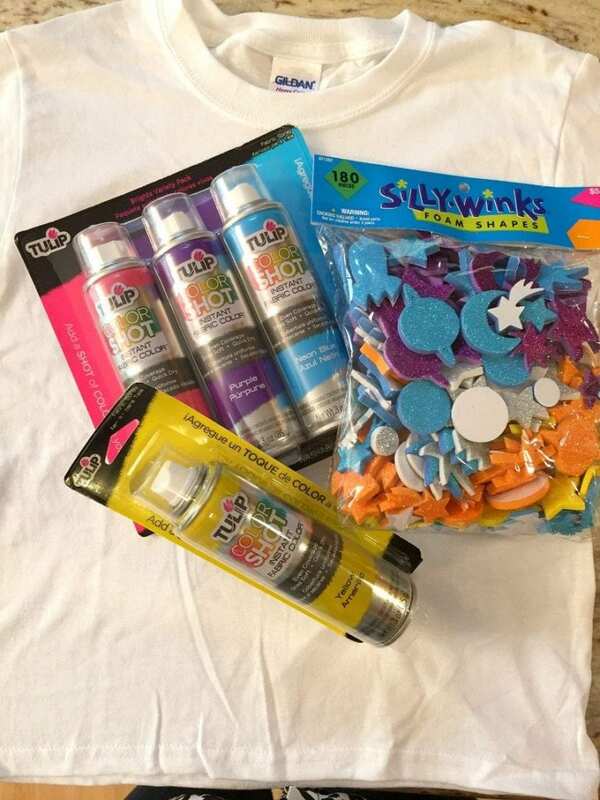 I decided to put a new spin on my kids crafty wardrobe and try my hand at fabric spray paint and a sticker resist technique. 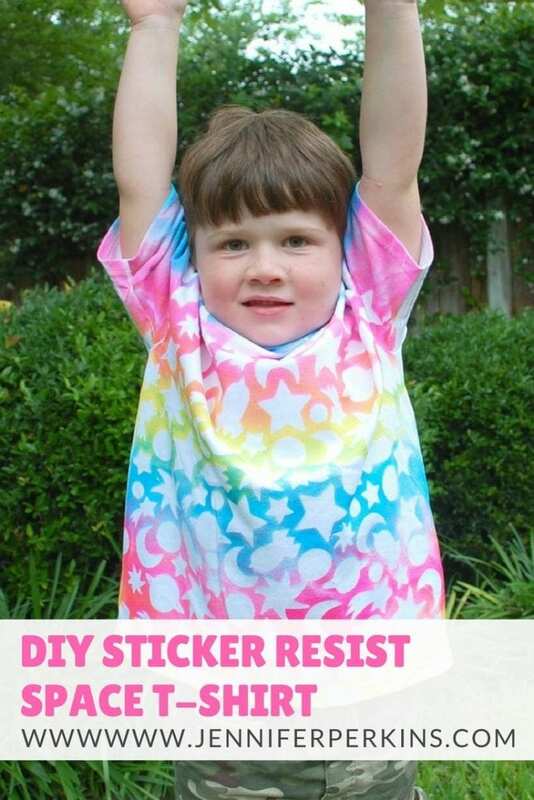 Not only that, this cool T-shirt idea also uses kid’s foam space stickers as a resist! 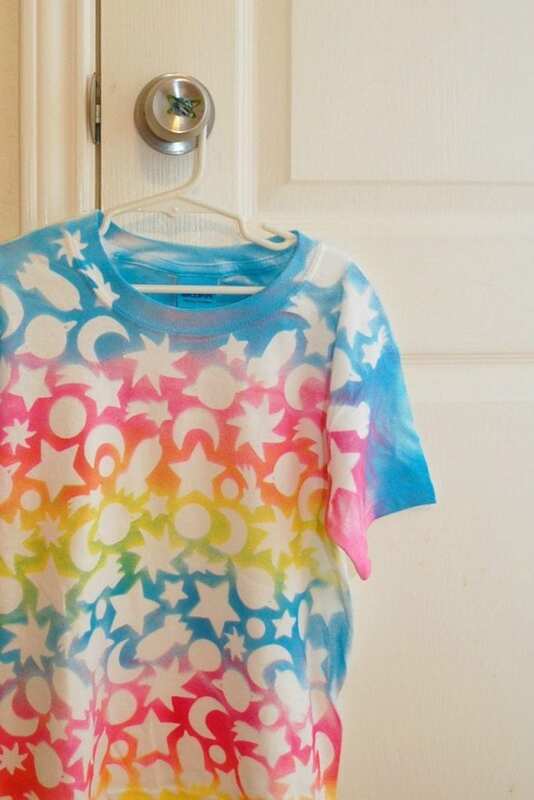 There are tons of ways to DIY a T-shirt and I have probably tried most of them. 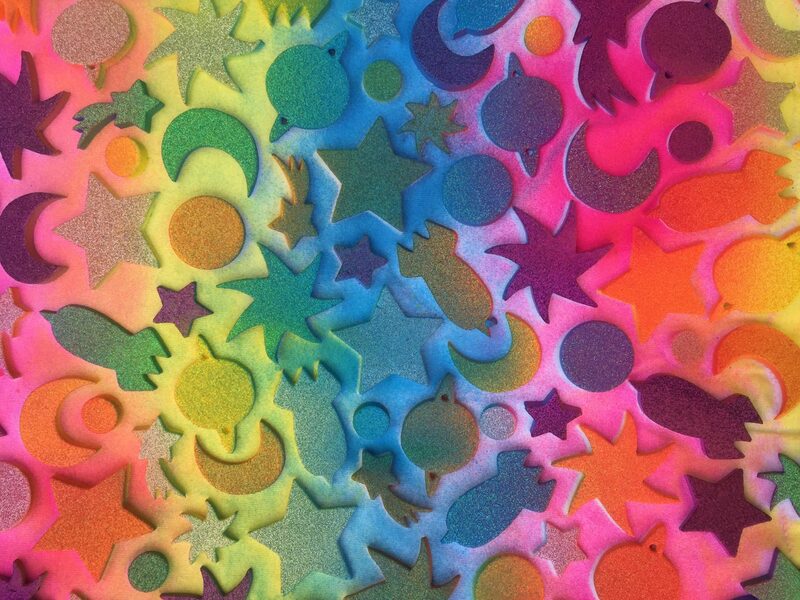 Using these thick foam kids stickers as a spray dye resist might be my favorite. This foam sticker resist technique looks awesome on comforters, planters, vases and coasters PLUS it is super-duper easy. HOORAY! Just look at the pure and utter joy on my kids face. He loves this shirt as much as I loved making it! Plus kids love helping put the stickers on the T-shirt! Yup just those 3 things. 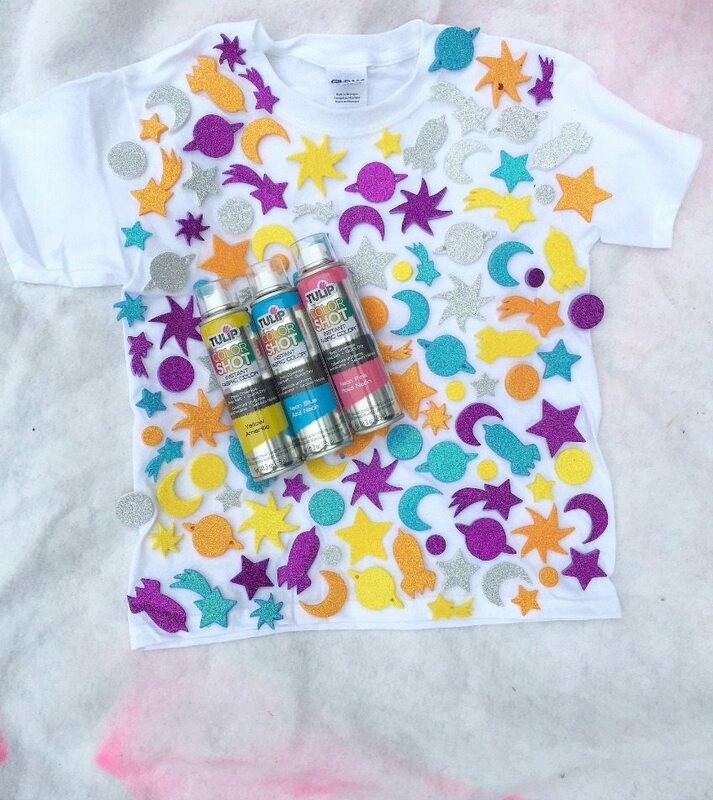 I told you this DIY kids T-shirt was easy to make! 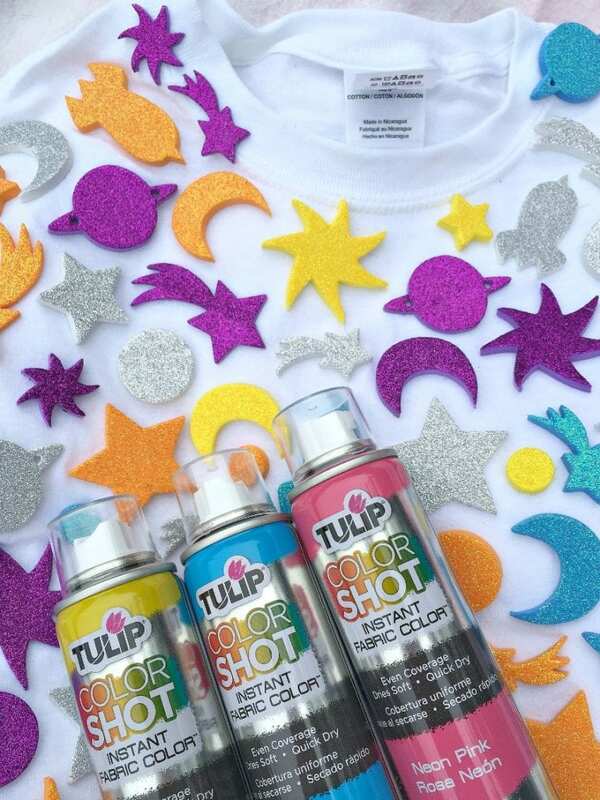 Put stickers all over the T-shirt you are going to spray paint. I know, complicated craft right? Let the kids help place the stickers, but try and make sure they are somewhat evenly spaced. The space in-between the foam stickers is where the fabric spray paint will dye the T-shirt. The more space, the more color. Fabric spray paint comes in tons of different colors these days. You can use one color on your shirt, or tons of colors. 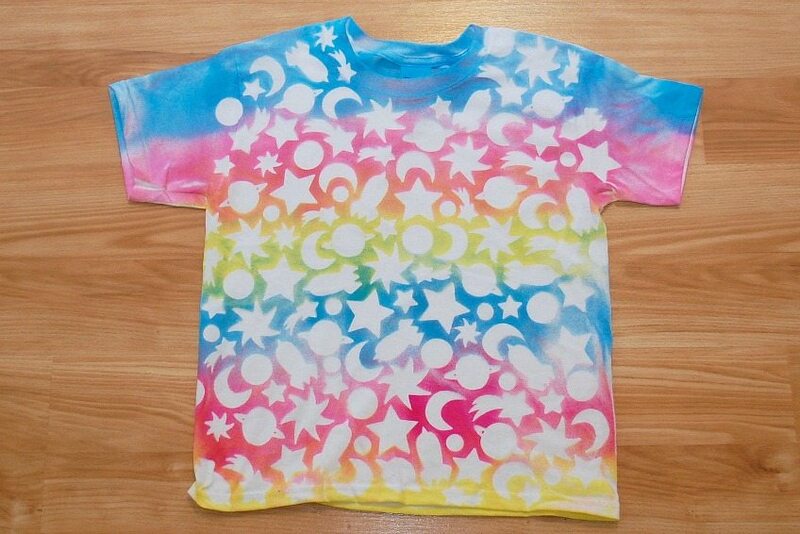 I love the ombre look of this crafty kids shirt. Plus ya know hot pink, blue and yellow look really cool together. Allow the fabric paint to dry completely. Peel up the stickers and throw them away. Reveal your new and exciting DIY space T-shirt. Oh wait this one is for kids, not adults. Let’s just look at this space-tastic T-shirt one more time because – come on people. Is your brain running wild thinking of all the sticker possibilities out there? Yup, I’ve been eyeballing those cactus stickers. My kid loves his new custom space T-shirt. Like a lot. I love his new T-shirt too, like so much I want one of my very own! Think you might give this idea a try? Lemme know what stickers you will use! Also, check out this project over on the AC Moore site. Want more DIY T-Shirt Ideas? Keep Reading! 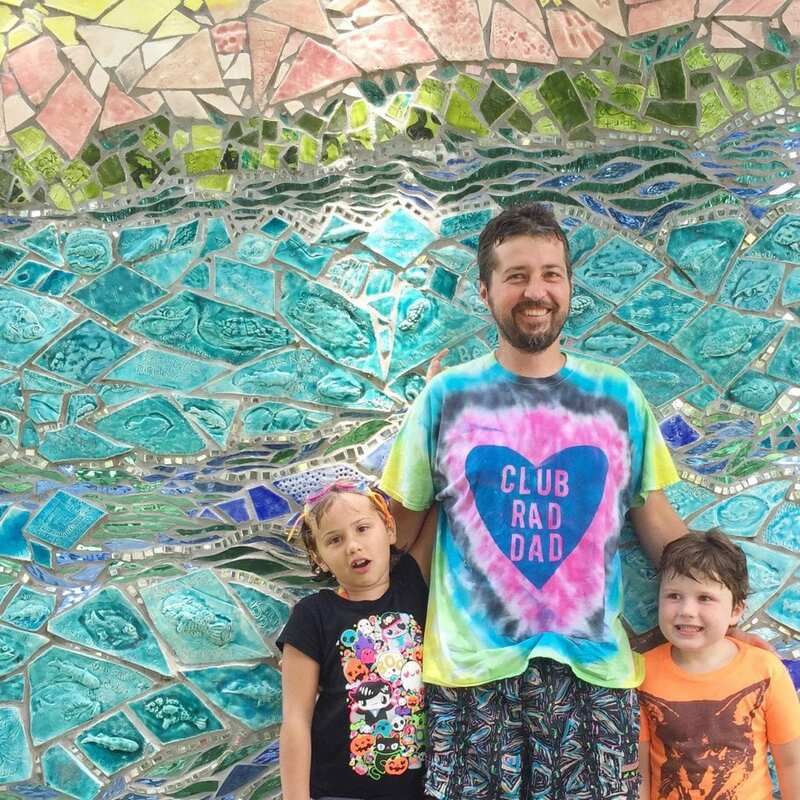 Easy Club Rad Dad T-Shirt – Using the same sticker resist technique, but this time with letters! Perfect for Father’s Day. 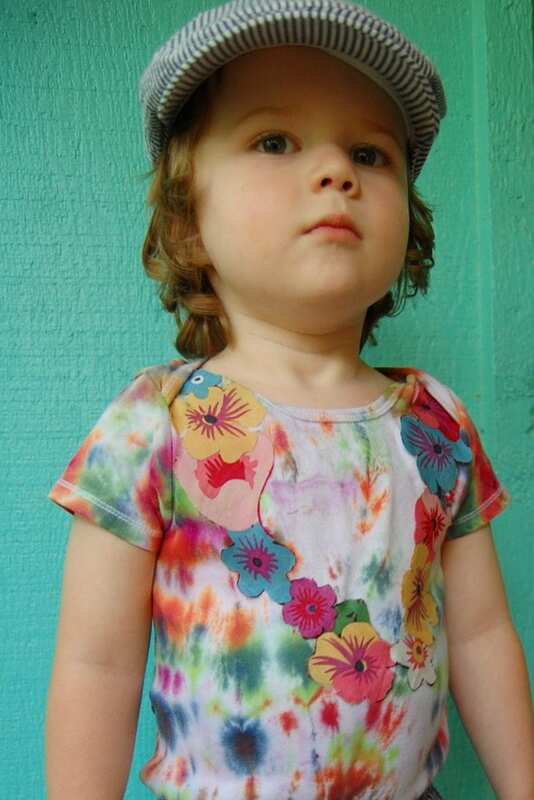 Tie-Dye Hawaiian Onesie with Applique Floral Lei – Can’t make it Hawaii this year? Me neither. 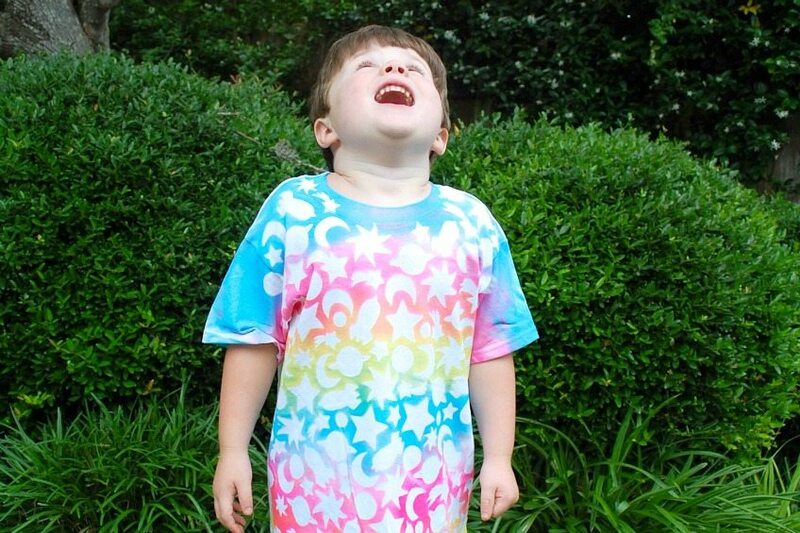 Try this DIY tie-dye onesie project instead. Don’t forget the DIY hula skirt too! 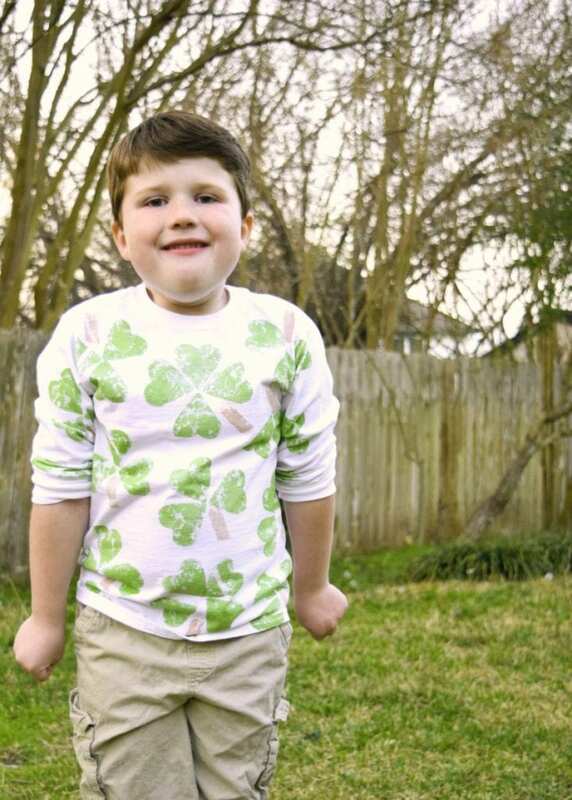 DIY Potato Stamped Shamrock T-Shirt – Rock the St. Patrick’s Day look with this fun and easy shamrock shirt potato stamped with fabric ink stamp pads! Posted May 22, 2015 & filed under Crafts, Kids Crafts, Wearable Crafts.